Sometimes you stare at pictures of a smiling bride and your lips just part into a glittering smile. Just like the radiant Rhita and her dashing groom, Mark we are beaming with smiles and laughter. Their wedding may have happened sometime last year but it looked just as beautiful as the New Year. Right from their pre-wedding photos, we knew that Rhita and Mark were going to have a beautiful wedding. 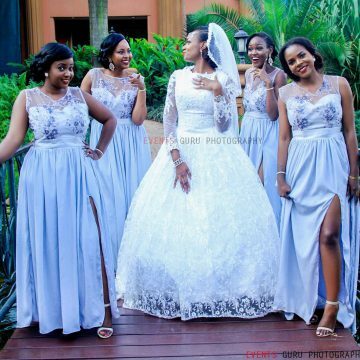 The bride gave us that chic elegant bridal look with her comfy wedding dress and enhanced natural glam up while the groom was all shades dapper in his blue tux. After receiving their holy matrimony blessings, the dazzling couple proceeded to the amazing Skyz Hotel in Naguru for a photo shoot before hosting their guests to a beautifully decorated reception where they served them drinks and eats as well as some relieving entertainment. The function was lit up by the gorgeous Rema Namakula who got everyone at the venue onto their feet in a celebration of the love between Mark and his belle, Rhita. Our friends at Events Guru Photography captured these moments.